The scenic landscapes and popular destinations along the West Coast can best be experienced when you rent a car. California has something for everyone, so whether you're exploring the breathtaking coastlines and best-in-class theme parks or prefer off-the-beaten-track experiences and bucket-list landmarks, Sixt has a car for you! For your convenience, our branches can be found in top vacation destinations and airports throughout California. Car rentals give you more freedom and flexibility, so once you get in the driver's seat of a premium Sixt vehicle, you are set to enjoy the endless sunshine in some amazing cities, such as Los Angeles, San Francisco, and San Diego. The state is a wonderland in the summer, with theme parks and a huge amount of outdoor activities for everyone. Temperatures will vary a lot from the northern part of the state, where you will find them rarely breaking 80, and inland in the south temperatures often hover in the mid-90s. There are tons of national parks to visit including Yosemite, Sequoia National Park, Pinnacles National Park, and Joshua Tree National Park. If you want to avoid the crowds at the most popular outdoor spots, head to the Russian River, Lake Tahoe or Lake County to enjoy the water. San Francisco, Los Angeles, and San Diego will all be crowded during the summer months, but it is also a good time to visit if you want a trip without rain and with warm enough temperatures to enjoy the ocean or lakes. Renting a convertible during the summer is a no-brainer, especially if you plan to drive on the Pacific Coast Highway. When renting a car in California, we've got you covered by offering great customer service and affordable car rental deals. In California, our airport and neighborhood branches offer a wide selection of brands and models, so you can customize your rental vehicle while exploring the state's iconic routes, breathtaking coastlines, famous cities, and popular attractions. With a one-way car rental, you can pick up a Sixt rental car in one city and return it to a different office. We have numerous protection packages and other optional features (such as GPS, child seats or an additional driver) to help you have an optimal car rental experience. Our extended fleet includes quality sports and luxury car rentals from world-class manufacturers like BMW, Mercedes-Benz, Jaguar, Cadillac, and Audi at affordable rates, so you can ride in style regardless of your budget. Make the most of the Golden State when cruising down Rodeo Drive or Sunset Boulevard by renting a convertible, such as the Chevrolet Camaro, Ford Mustang. If you're planning a city trip and need more leg-room and gas mileage that won't burn through the gas budget, we also offer compact car rentals from trusted brands like Ford, Toyota, and Volkswagen for those that want to see more without burning through their gas budget. Friends that travel together, stay together. So, for outdoor adventures or family trips that require more luggage and gear, renting a full-size SUV or minivan is your safest bet. Highway 1: The Pacific Coast Highway is one of the best road trips in the world and best enjoyed in a sedan. Your journey begins in the southern city of San Diego, then continues north through beach towns, Los Angeles, Santa Barbara and the surrounding wine country, more beaches and attractions in Carmel, Monterey, and Santa Cruz before finally concluding in San Francisco. The Big Sur: The Big Sur is a rugged section of the PCH along the Central Coast and is considered one of the most scenic road trips in California. Whether you want to enjoy the ocean vistas, the redwood forest or simply enjoy the ocean coastline, this is best enjoyed in a convertible to really get the most out of the ocean breeze. If it's your first time visiting California, you can learn more abour road rules by reading our handy article about driving in California. Whether you're a first-time visitor who just arrived at the airport or are a tenured local, The Bay has a little of everything that can best be discovered when you are in the driver's seat. 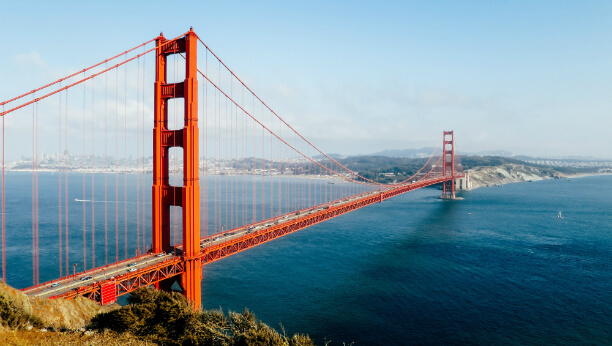 From the comfort of your Sixt rental car, you are set to explore everything this city has to offer and will certainly leave your heart in San Francisco. Indulge yourself by driving out to visit some of the world's finest wine country resorts in Napa and Sonoma. Drive through the orange arches of the Golden Gate Bridge. Enjoy a 2-hour road trip to Sacramento. Visit popular neighborhoods like Beverly Hills and Venice Beach. Take the studio tour at Universal Studios Hollywood. Cruise the legendary Sunset Strip in West Hollywood. Experience the magic of SeaWorld San Diego, located in Mission Bay. Explore the world-famous San Diego Zoo or visit the nearby San Diego Zoo Safari Park. Enjoy family-friendly fun at LEGOLAND California Resort.